Vackra anpassade tropiska 3BR / 3BA hem byggdes 1999. Du kommer att njuta en nyinredda (2012) hem med alla bekvämligheter. Det här hemmet har en öppen planlösning och vackra trägolv med stora franska dörrar från både vardagsrummet och sovrummet som strömmar till stora utanför skärmad uteplats, perfekt för människor att njuta av tropiska vindar och rymliga underhållning. Medan du njuter av att titta på båtarna passera från Uteplats, kan du njuta av några frusna drinkar från passera genom fönstret från köket, medan den kyldes från 2 overhead fans. När du är redo att avveckla det ner för kvällen, kan du krypa upp i någon av de 2 Queen size sovrum med en 22 tums LCD-TV i varje rum, eller en King Size sovrum med 43 tums plasma-TV. Varje rum har en dockningsstation för iPhone för dig att njuta av några Jimmy Buffet låtar medan sig redo för dagen. I vardagsrummet finns en 51 tums plasma-TV och högtalarsystem med Pandora Internet Radio och iPad dockningsstation. Trådlöst internet Tjänsten är tillgänglig för dig att använda för att kontrollera vädret och fiske / båtliv villkor från din bärbara dator eller iPad. Förutom de 25 fot tillgänglig docka för dig att parkera en båt på denna djupt vatten, är klart kanalen perfekt att svalka sig i med ett dopp. Den badstege ger enkel åtkomst i och ur vattnet. Det finns tillräckligt med parkeringsplatser för upp till 8 bilar på uppfarten, en RV, eller om du är så benägna, en prop plan som du kan flyga till den lilla Summerlandningsbanan, bara upp på gatan. När du bosätta sig i för ett par dagar av lugn avkoppling, är den historiska och spännande staden Key West bara cirka 30 minuter bort. Här finns massor av museer, vattensporter, restauranger, shopping, botaniska trädgårdar, stränder och enorma nattliv! Cirka 15 minuter i norr är den berömda Bahia Honda, som presenterades på världens bästa stränder på Travel Channel. Bara 20 minuter till Sombrero Beach och minuter till Looe Key rev, känd för fantastiska dykning och snorkling expeditioner. Med din hyra får du en detaljerad paket turist rekommendationer. Oavsett om du är redo för lite R & R, några hummer eller Stone Crab, fiske, segling, simning eller sightseeing, kommer detta hem ger dig en första klass, tropisk upplevelse. Absolut inga husdjur och ingen rökning. Last Feb. was so good away from our beautiful western NC mountains while we stayed in this home that we decided to go back! The owners have clearly maintained this property and have added extras including a "major league" ice maker. The house is equipped with many extras that make it very livable and comfortable. We entertained two other couples for four days during our month and the house worked well with its 3 BR/3BR layout. The owners are very responsive and easy to work with. Summerland Key is situated very conveniently to Key West and offer many services right there on the Key. My wife and I recommend this neat canal house on Summerland Key! A great change from the Feb mountains in Western NC, We found the home online and it was all that was advertised! The owners have put so many extras and personal touches here that were beyond our expectations. Summerland Key has quite the unique little stores-grocery, bait, liquor, hardware, cafe- that one can avoid the trip to Big Pine or Key West. Key West only 25 miles away if you like the crowds there. We sure enjoyed our month here and appreciate the owners sharing it with us! harry ( clay ) k.
We didn't get chance to go out on the water but the dock was very nice. 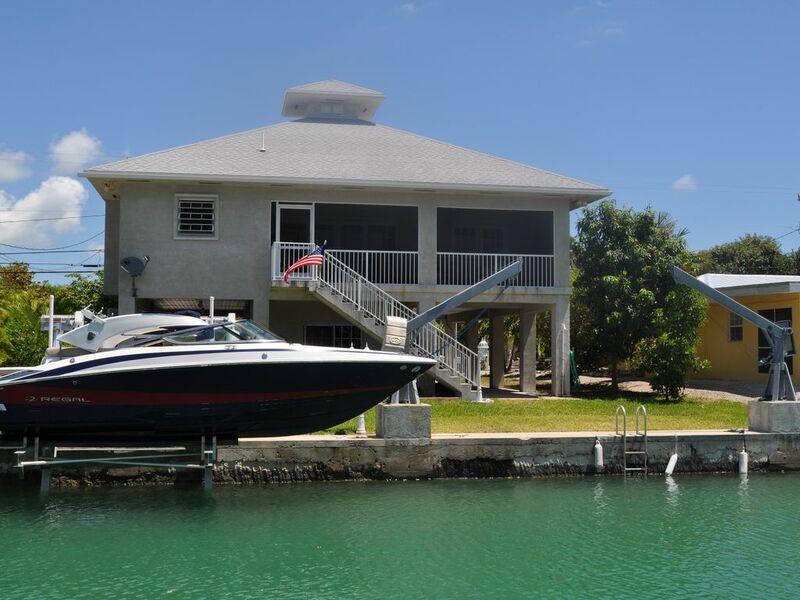 This was a beautiful house in an excellent situation on one of the canals in Summerland Key. The owner has furnished and equipped the house to a very high standard. They have thought of everything you would need while holidaying in their property. Attention to detail is first class.The property looks good on the pictures but it is not until you see it that you realise what a lovely home it is. It definitely has the 'wow!" factor. I would not hesitate to recommend this property. My wife, two teenage boys and 10-year-old daughter went to enjoy the lower keys during the week of lobster sport season. Seas the Keys was ideally located to take our 16' Sea Ray out to Looe Reef for snorkeling and out to other reef areas for fishing. A little further out past the reef, the mahi mahi were biting at this time of the year. However, my family are less enthusiastic fishermen than I, so I didn't push that. Don't miss Looe Reef. I believe this spot rivals any family friendly snorkeling location in the Bahamas, Virgin Islands, Florida Keys and the Dry Tortugas (including Little Africa off Loggerhead Key.) My daughter was pumped to get her first underwater glimpses of reef sharks, nurse sharks and a 400-lb Goliath Grouper that sought shade under our boat. We also fished the bridge at Kemp Channel very successfully for mangrove snapper and visited the area around the Content Keys to do our lobstering. My daughter enjoyed swimming in the canal and her enthusiasm often encouraged other family members to join her. We spent a day in Key West visiting the Truman Little White House, touring the Hemingway House and exploring. Key West is about an half hour drive, and we decided to return two more evenings for dinner, and the sunset street performances at Mallory Square. Our activities took us far and wide, and the time we spent in the house winding down at the end of the day was very comfortable. The furniture, flooring, bathroom fixtures and other appointments are fresh and maintained in a like-new condition. We enjoyed preparing our fish and lobster on a very nice grill before dining and playing cards at the dining room table. The living room area furniture is very comfy and invites relaxation while listening to music from Sonos on the stereo system. This is an excellent lower keys vacation home from which to launch your activitities and exploration. I came down to the Keys kinda spur of the moment and was lucky enough to get this house for a week. The house had everything I wanted and alot of extras. Kicking back at night sitting in the screened in deck listening to the sound system and looking at the green back lit water in the canal is just heaven. Thx to the owners and I'll be back..
Summerland Key är rätt mellan den berömda 7 mil bron och Bahia Honda, en berömd State Park och strandområdet, och Key West. Det har en pittoresk liten stad, tyst känsla, samtidigt som skryter bekvämligheter, såsom en liten livsmedelsbutik, gas, bank, etc. Bara 10 minuter från en större livsmedelsbutik, och 25 minuter från den berömda, historiska part stad, Key West. Har det bästa av två världar!